After many months of planning, the MULSS Women’s Portfolio hosted their biggest event of the year on Wednesday the 6th of March – a panel discussion celebrating International Women’s Day. 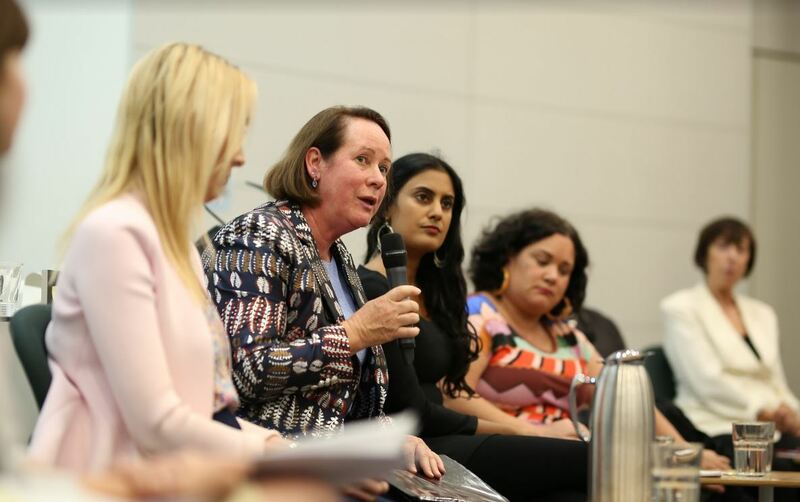 The panellists included The Hon Marilyn Warren AC QC, Justice Debbie Mortimer, Elly Patira, Jasmine O’Brien, and the law school’s own Professor Jenny Morgan and Dr Shireen Morris. For some, the law school can, at first, feel like a very foreign place. You’re suddenly in a world that has historically been dominated by a select ‘elite’, learning about a legal system that has been made both by and for those with power and privilege. You are taught to apply hundreds of rules and principles with little time to reflect upon or question them. For me, attending the panel last year was when I realised that there are spaces within MLS where critical discourse can and does occur. And so, our objective for this year’s panel was to ensure this space continues to flourish. We began our discussion by asking our panellists to speak briefly about their experience in the law and the legal profession as women. As we had hoped, our diverse range of panellists produced a diverse range of responses. Elly Patira, Director of Aboriginal Affairs Policy within the Department of Premier and Cabinet, for example, pointed out that her experience of feeling like a ‘fish out of water’ arose not so much from just being a woman, but the intersections of being an Aboriginal woman, her socio-economic background and being the first in her family to attend university. Jasmine O’Brien, principal employment lawyer at Sladen Legal, observed that once she transitioned and was ‘read’ as a woman in her professional environment her experience was much easier than when she was, as she described it, a ‘camp’ gay man. For Jasmine, it was liberating to no longer have to think about gender at all. What was also fascinating to see was how the generational differences of the panellists played out in their responses. Marilyn Warren was the first woman Chief Justice of a Supreme Court in Australia, and the first woman to be an article clerk with the Victorian Public Service. She faced obstacles at the very beginning of her career. While she acknowledged the situation is generally very different for women now, reflected by the fact that the MLS student body is now over 50% women, Professor Warren was also very aware that structural barriers are still pervasive in the industry and need to be addressed. In particular, more flexible workplaces and working arrangements were flagged in the discussion as being crucial to increase women’s advancement in the legal profession. This was highlighted by Elly Patira’s almost on-the-spot epiphany. The discussion prompted her to consider, and she then shared with the audience, that she had understood her move from commercial law to public policy as being purely motivated by her changing interests. She realised however that this move was also partly, and perhaps subconsciously, motivated by the lack of support and flexibility the commercial sphere offered her with respect to her caring responsibilities as a mother. Interestingly, Justice Debbie Mortimer raised a contrasting view and felt that working urgently long hours may just be part of the job, given the law deals with ‘people in crisis’. This perspective, however, may well come from Justice Mortimer’s own particular expertise as an immigration and refugee advocate where the element of crisis is very real and immediate. The discussion raises an interesting question: to what extent have we simply accepted the demands of the legal profession more generally as urgent, immediate, and all-consuming? Certainly, even just at law school it can often feel that way. But this may well be a dangerous myth that has slowly been built up and reinforced to now appear as something inherent in the practice of the law. Of course a client, or a partner, may say to you that something is ‘urgent’, or that it requires you to stay back late tonight. And tomorrow night. And the night after that. But we should consider if this is actually true. Perhaps this status of urgency is purely a product of societal and professional expectations of the legal industry, and not always from the actual legal issues at hand. I say ‘dangerous’ because if this is truly a myth, and it continues to be perpetuated, those in society who still bear the majority of caring and other domestic responsibilities (i.e. women) will continue to be pushed out, or forced to go in a different direction, because of something perceived to be ‘just part of the job’. The panel also traversed a number of topics, ranging from #MeToo to the use of gender quotas. There is not room in this article to cover all that was discussed, but for those who weren’t there and are concerned or put off by the demands of commercial law firms, it is worth repeating one of Marilyn Warren’s concluding comments: clerkships are not the be all and end all, and there are certainly many paths for where you want to go. I think that has some weight, coming from a former Chief Justice.